Here's a new Awigze/Bud thing that's been kicking around for a while. Basic guitar-bass-drum track went off to Andy some time ago after sitting in the APOD folder for a bit with no action. The original demo was about 1:30 long which Andy looped and played over - two sax lines and a Djembe. I deconstructed the song and rearranged the sax parts a bit while also losing the Djembe - which was cool - but I couldn't make it work in the new deal. Then I added three tracks played from my iPhone. A tanpura drone - a shruti box drone and a mellotron (Manetron is the app name). I decided not to add any lead guitar - letting Andy lead the way against the tide of rhythms and drones. A little drum reversing in Audacity added in at the beginning sealed the deal. Again - Andy is the consummate artist and gentleman. Always a pleasure to work with. This final mix came fast - please point out any improvements that could be made. in all the right ways, funk-alicious...yes! I just lay the foundation. Thanks for stopping by. If there was an MJ Ultimate Coolness Award, this would win it in a landslide. ..... and the rest isn't too bad either :) With the addition of a new bassist and hopefully a jazz-oriented keys player to our live set up soon, I'm getting more and more interested in this sort of groove. This sounds terrific on my phones. Great playing Andy and Kevin. be sure to post the start - always fun to mark progress. Andy has such a great tone here. liked the way you handled the sax... I guess after a couple of collabs under our belts we don't have to email too and fro as much... as a result I actually forgot about this one for a while. sorry about the rhythm track not working out,,, it was actually the old tennis shoes in the dryer trick. You'd think after a while I would be able to keep a tempo. dig that rhythm track about as much as Jiggy does. very cool indeed. Thanks again for a fine collab. I like the sense of danger playing about in this score. Bud, some of your instruments (well most!) are unknown to me, but they sure sound fine here--and so do you Andy. Excellent work! the tanpura is a drone instrument used to accompany ragas - the shruti is often used in a similar fashion. 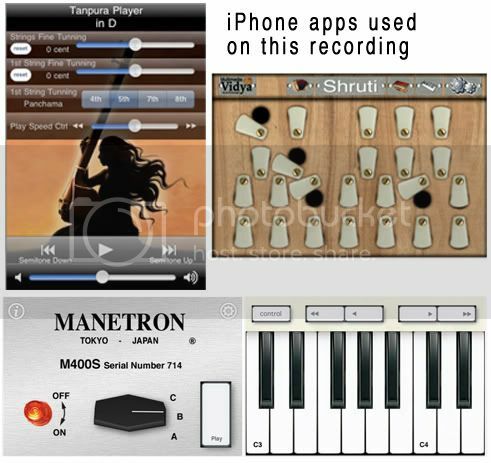 The Manetron is a mellotron app complete with mechanical noise and tape hiss. Yup - never enough sax - right? Very creative. The sax treatment is just up my alley. Solid stuff. Andy records his instrument really well - and I tried to stay as dry as possible while still adding a little juice for the mix. There is a great groove in here. Andy's performance is great !Great work, enjoyed very much. even in an old Irish kid from Philly. Andy rocks! this started life as an homage to A Certain Ratio - a great Manx band. we're chillin' by the pool. I love all the sounds in this the arrangement of them spacing it out just right and of course andy slides across the top of this, crazy the tech aspect of this soon we will think music onto a computer I cant wait! excellent!!!! a better controller - playing that little mellotron is a pain. Cool, it feels like an action movie score. Nice groove, tight playing. never looked good on me. A7 needs a sax player - I've often though about that. Thanks for dropping by. I did amplify the master in Audacity - guess I could have pushed it a bit more. You got the early press release? Glad our manager is working. Nothing like a little funk and jazz swing..funny ,I got an old Danelectro too...I came from N.Y. and live in Philly !! I barbecue and ride a bike! I'm using the iPhone in live shows now. About the length - I thought it good to get in and get out. Lots more music to hear here. Also - I would have had to write a bridge. ... alackbass had it in his comment! Such a cool piece. Very interesting tracks and sounds. I totally dig your creation here, gents! Smooth sax work... but I still hear some fusion guitar licks in there! Ibstrat, are you there? :) Seriously though, this is amazing. never too late - right? Thanks. This was created from an iPhone app? That is incredible, it sounds awesome! I'll certainly have to check out the app. I've seen a few music apps but was a bit skeptical to purchase them. Wonderfully done, kudos to you both! the rest is all real instruments and midi drums recorded in GB'08. Next piece we do all iPhone. toe-tapping groove masterpiece. cool sax as ever with awigze....grover washington on acid. funkalicious. killer team without a doubt... The awesome backing of Kevin, the sax of Mr. Sax himself... whats not to love!? I have to admit it. I love it when its sounds like someone else did it after a day or two. Who were those guys? I think this is our fourth or fifth tune together. And yes - we spoke when he was in NYC for 24 hours but too pressed for time to get together. Something I regret. good grief - i'm missing too much music lately. this is fabulous! Andrew is right, this would win "ultimate cool" award, hands down! GREAT track you guys - congrats! Nothing like some good sax to up your cool quotient. Beautiful sax, and a great background rhythm section. Funky and sounding really cool, that sax really blows! It's fun to come up with different settings for his talent. very streets of the 70's sound,you almost expect the wail of a sireeeeeen or the screech of tyres and a bullhorn crackle.Nice smooth sound with a bit of edginess to it. very insistent drums - played around with some other feels after the fact - but stayed with them I like how Andy laid smooth long lines across the drive. A wild cool breeze. alackbass is spot on- "MJ Ultimate Coolness Award is yours. in the middle between funky and jazzy and techie and iPhone-y. Great sax, cool beat. Inventive and audacious! Just what I'd expect from you, Mr. Bleeding edge. Bravo. sounds like a really gifted funky band - love it. To put this in. Cool groove. Mix sounds excellent to me. Always amazed by Andy's choice of scales. this is incredible! funkily groovily 007 kinda coolness. LOVE that frenetic percussion energy throughout. The drones are awesome underneath everything. i LOVE this - going on the iPod for sure - and NOT in the "time to sleep" playlist! Lots to like here. The sax really cuts through, and the cut and paste approach is sophisticated and beautifully handled. Great art, too.